He is the 2nd son and the 3rd child of the Queen and the Prince Phillip, the Duke of Edinburgh. Prince Andrew was born on February 19, 1960. In his younger years he was educated by a governess. Later, he attended a few different schools were he was very active in sports, just like his father and brothers. His involvement in cricket, rugby, and soccer demonstrated his athletic interest. He had also an avid mind for flying. He earned his Parachutist�s Badge from the Royal Air Force, like his brother Charles. He wed Sarah Ferguson on July 23, 1986. Two children were born to the Duke and Duchess of York. They are fifth and sixth in line of succession to the throne. He was addressed as Prince Andrew until his marriage when he received the title the Duke of York. 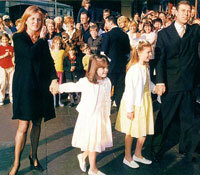 Unfortunately, in May 1996 the Duke and Duchess of York were divorced. Prince Andrew holds one Naval Service appointment, the Admiral of Sea Cadet Corps. The Duke of York is a Patron of, or associated with over 100 organizations. Many of these organizations reflect his interest in his career as a navy pilot. He also became President of the Football Association. Even though much of his time is devoted to his naval career, he also undertakes a range of royal engagements.